Update: I just joined a great party at domestically speaking ! rooting around the fall decorations at home. I thought I'd start out small since it's still pre-Labor Day. let Mother Nature know I'm ready for cool weather! Here's some more of my blue and white collection too. A mod podge of appetizer plates collected at TJ Maxx. my parents with a gift in it for my son. Well, one piece done, more to come! I'm joining Marty at A Stroll Thru Life & The Gypsy's Corner. I told ya'll I'd keep you posted as I learned this new retail world so here's some more things learned as we close out week 3 of the store being opened. Number one ~I never have enough time to get all the "business" things of running a new business done. This includes banking, paperwork, supplies, inventory orders. Number two ~in the shop I have nothing but time, especially when we are slow. One would think there would be time to do number one above, however a slow trickle of shoppers means I can never "get involved" in a in depth project like setting up tax reports. This maybe self explanatory. I thought I knew nothing about retail and would have a lot to learn. Turns out there's a world of retail lingo out there I don't know & probably have only tapped into a tinsy bit of it so far. Some days I open the store and hope to get just one sale. Heck some days I open and hope to get one customer~although I've been lucky with foot traffic so far. Other days I've measured success for the day by completion of a display or an inventory order or even this blog post. Still happy I've opened the store. Still understand it's really early in the game. I thought I'd share with you today another tabletop display at the store. This one is themed on scarecrows and sunflowers. I love these pumpkin sunflowers. Aren't they cute? ideas for Sunday School, hostess gifts, grandkid surprises, etc. Looks like harvest time to me! I'm joining Table Top Tuesday and Three or More Tuesday. I'm linking to Weekly Words to Live By at Notes from a Cottage Industry, who's blog I adore! I have this little angel. For me she left her wings. She has no idea how much happiness she truly brings. She brightens my days with her smiles and her laughs. She helps me to remember all the blessing that I have. Her face, is so perfect, she's sweet and soft and pure. Sometimes she can be willful and sometimes she's demure. She tries very hardest to please and do what's right. She gives the greatest hugs from morning till night. Every person that has known her sees this light within her soul. I know that in this whole great world, she has a special role. She's helpful and considerate to everyone she knows. This light in her shines brighter as my angel grows. When she sees someone is sad, it opens up her heart. She wants to do all that she can; she wants to do her part. She'll squeeze away the sorrow and make me forget my pain. She shows me where the sun is when we're hiding from the rain. I knew that she was so much more than just my baby girl. And when she grows up one day she would be my closest friend. She would be the reason I always try my best. For my little angel baby girl would be my greatest test. For when God entrusts to you an angel, who has left her wings for you. Encircle her with love with everything you do. Let her know God made her, and that He trust you with her care. Be sure to make time for special moments with her to share. A watchful eye and hand to protect her from this world. Protect my little angel; protect my baby girl. When Miss B left for law school a few weeks ago I must say I felt so proud of her and her accomplishments! I feel this poem represents so much of how I feel about her. A mom at 17, I could never imagine her becoming a law student when that picture of us (me with the long hair) was taken. Recently I read Ms. Garrity's blog about coffee table ideas and decided yes, my coffee table does need a redo. towel my mother gave me as a base. Then I layered in some of my Star of David collection - a cake plate, coasters and a candy dish. classic An Affair with a House. 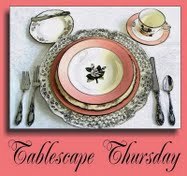 I love the scalloped detail on the base of this cake plate. It's a bit hard to see by picture, but the glassware showed nicely against the dark wood table. 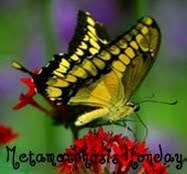 Metamorphosis Monday, Table Top Tuesday, Three or More Tuesday, and White Wednesday. I had done last year, but in addition I added in some rust and yellow. I love these faux corn cobs to mix in with your pumpkins & gourds. The addition of this table runner adds a nice texture. A line up of pumpkin spreaders and utensils. Hope you're getting ready for fall too! 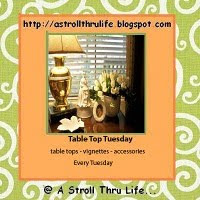 Today I'm joining Table Top Tuesday and Three or More Tuesday. It's official. My little slice of retail heaven opened at 10:00 AM yesterday. I can't thank my family enough for all their love, support and hard work helping me get open in just three days! You may remember what the store looked like before here. These are some general shots of each wall. I will share more pictures later on of each display. I was very happy with the shopper turnout yesterday. Now for my long list of what to do & change!